Anatoly Kulik’s four-man team became the first to circumnavigate the globe in an inflatable catamaran. Different people have been on board the catamaran over the course of its miraculous journey. Some made one of the trip's four legs, while others made two. The crew that completed the final stage of the trip consisted of four men. It is a sigh that everyone breathes, except Olga. Her husband is on board that tiny, sail-powered catamaran, and he has traveled thirty thousand nautical miles on it. He is safe and sound – and he is almost certainly crazy. Someone makes a joke and everyone gives a forced laugh. The sail slowly lifts from the scruffy catamaran and takes up the wind. The insane idea of circumnavigating the world on a home-made, inflatable catamaran first occurred to Anatoly Kulik nearly a quarter of a century ago. However, he and his crew only managed to set sail in 2008. He decided to split the trip up into four stages. He set off from Phuket, Thailand in February 2008 and headed for the United Arab Emirates. According to the trip participants, it turned out they had to rebuild the vessel almost entirely from scratch after the first leg of the trip, factoring in the severe weather they had encountered. The next leg was slated for 2009, on a much longer route that brought them safely to the Seychelles Islands. More dramatic was the team's third section, covering a route just under 7,770 miles. The Russian team navigated the part of the route believed to be the most dangerous – setting off from Mauritius, following the African coast, around the Cape of Good Hope, and then across the Atlantic to the shores of South America. The crew entered the Guinness book of world records for their crossing of the Atlantic, but the longest and most arduous part of the journey was still ahead. 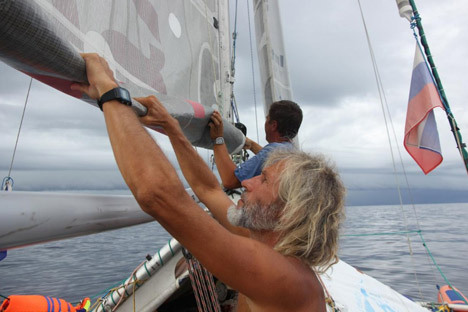 In late March 2012, the team cast off from Fortaleza, Brazil to complete their final passage. The statistics speak for themselves – more than 30,000 nautical miles, 38 exotic countries, and 13 months at sea. The catamaran's appearance after it had weathered this distance inspired both pity and awe. “Well, this is actually how we lived on board,” says Yevgeny “Jack” Kovalevsky, deftly balancing himself on the catamaran deck. Three journalists try to fit themselves somehow onto the deck where four men had spent 13 months. The crew’s cameraman, Yevgeny Tashkin, is whistling through his teeth as Jack explains how they managed it all. The suaveness in his voice suggests the kitchen of a top-10 Michelin Restaurant – but no. The kitchen turns out to be a waterproof box. Kulik carefully opens the box, to reveal its hidden treasure – a gas burner. Dinner was prepared on it every evening. It turns out that the ship's cook –Anatoly Kulik – was also the ship's captain, the ship-wright, and the brains behind the entire escapade to sail the world on an inflatable catamaran. Kulik is one of Russia's “outstanding travelers.” This is not a metaphor, but one of the official awards made by the government in recognition of his outstanding achievements in the study of Earth. The entire deck runs about 130 square feet. There is a box with a gas burner for cooking. There is also a water tank. Close by, tins of food are carefully packed away in a box. The cans, we might add, were cheerfully chucked overboard after use; despite conventional scientific thought, the ocean water dissolves the metal entirely after just a few days. Plastics, however, were stored aboard until they could be disposed of responsibly at the next port-of-call. Don’t even ask why four grown men only needed a three-man cabin. One of them would be continuously on watch. The watchman would spurn the darkness to sit at the rudder, stopping the catamaran from being carried off at the whim of the waves and keeping it on the course that helmsman Stanislav Berezkin had calculated. Meanwhile, Jack reveals how each of the four sailors had arranged his little corner – his home for the 13-month-long journey. The sleeping bags lie in a row, an electric torch over every bunk, clocks, and a Russian Orthodox cross given to the seamen by the Russian community at one of their ports of call. By Jack's bunk there is a special pouch for a soft toy rabbit – the crew's constant mascot on all their voyages. Jack chats to his interviewers on the deck of the catamaran, and all the while the conversation is accompanied by the crunching of boots. They trample the Thai roses, with which the vessel had been strewn by well-wishers on arrival. For the crew, this is all still a dream – the tearful eyes of their families, the giggling children, the completely unknown admirers who have come to meet them. There are Thai sailors, pointing at the vessel and debating whether to take the crazy Russians out to dinner or accompany them to a psychiatric hospital to test for absence of the instinct for self-preservation. The latter, of course, is unnecessary. These tanned, unshaven men are only too aware that any mistake could have been their last. Yet what that mistake could have been – this is what they do not know. Jack is seemingly reluctant to talk about Atlantic sharks, which seemed to think the catamaran was an exotic delicacy. After the sharks took a sizeable bite out of the boat's underside, the laws of physics dictate that an inflatable boat ought to sink to the bottom. They had to dive under the boat and plug the hole from below the water – all while hoping that the sharks had already gone home for the day. Sharks, however, were far from the end of their adventures. The light vessel was tossed around so violently in storms that it seemed it would capsize. The captain recalled how, on one especially violent night, it took all four of them to hold the rudder, fearing that they would be overturned. That would mean losing the mast – and with it, any hope of ever getting back to shore. The last leg of their journey brought them a new test. On the way to Malaysia, the catamaran was left without one of the cables that support the mast. Thanks to some reserve tackle, the structure was saved from falling down like a pack of cards in the hands of a drunken conjuror. The crew is not keen to discuss these moments – whatever happened, just happened. Even brief moorings in uncharted harbors of Polynesia did not pass without incident. “When we neared the coast, we often had no clue as to what color the skin of the people who lived there might be,” says Jack, grinning. He recalls how the crew learned to communicate successfully with locals, without even knowing the local language. On the other hand, they were ceremonially received at other stops. The team had brought with them to Phuket a “map of happiness” from Tomsk, Russia – the flag that accompanied the Russian boat on its voyage. This flag is now strewn with the autographs of diplomats, officials, prime ministers, and even members of royal families of the countries where the travelers stopped. The sailors recalled that the earlier months of their travels were accompanied by the sound of a guitar; but, in the final weeks, those who were not on watch would flop down instantly to sleep. Anyone still interested in strumming quickly learned a lot about himself and about the guitar. All of the expedition members agreed that being cooped up for 13 months with three other guys in a confined space – and without a moment's privacy – was far from easy. Olga's orange frock no longer gusts in the breeze – she lavishes her every moment on her husband, whom she has not seen for over a year. The men, who have left 30,000 nautical miles of sea water, salt and wind behind them, have needs that are probably just as pressing as Olga’s. Maybe they are dreaming of fresh bedsheets or a guys’ night out in Thailand? Yet Jack insists that the members of the team are “envoys of Russia,” and they hope to meet the president to discuss their trip in person. The journalists offer to help – after all, the men definitely something to say. “We've come back different people than who we were when we left,” says the crew's helmsman, Stanislav. The crew is now planning to spend a few months getting themselves back in shape and recuperating after the endeavor. Yet all are certain that Anatoly Kulik's team will have another epic voyage across the ocean ahead of them. Different people have been on board the catamaran over the course of its miraculous journey. Some made one of the trip's four legs, while others made two. Anatoly Kulik is an Outstanding Traveler of Russia (an official Award created by the Federation of Sports Tourism), a member of the Russian Geographical Society and a Master of Sports in sports tourism. He served as captain and coxswain of the catamaran. Yevgeny Kovalevsky is an Outstanding Traveler of Russia, a Master of Sports in sports tourism and a member of the Russian Geographical Society. He has been twice awarded Russian Champion and once awarded the silver medal in aquatic tourism. On board the catamaran he was the main “diplomat” and translator. Yevgeny Tashkin has been a team member on more than 10 of the Russian Geographical Society's toughest expeditions. As part of the catamaran crew, he was the cameraman, photographer and chronicler of the voyage. Stanislav Berezkin is a Russian Champion in sail tourism. He acted as the helmsman on board the catamaran and was responsible for communications and navigation.